This website is my home on the web where you will find all sorts of stuff which is uniquely me. In my spare time, I write quite a lot - fiction, non-fiction, blogs... all over the place. My blog is a mixture of business and personal, hosted on Wordpress, and around the website you can find information about my communications expertise, my writing, and me. Feedback is always welcome, so feel free to email me on any topic. As a communications professional, my goal is to enable people to work flexibly enough to meet both their personal and their business goals - liberating individuals to contribute in their own special and unique ways, creating increased value for both employer and employee. The key is to use communications technology effectively. Navigating your way to a successfull communications infrastructure is not easy. You may need a little help understanding what the technologies are, what they can do for you, and where the world is heading. You probably have a feeling you could create something really significant, but aren't sure exactly how. And you're wary of expensive mistakes. 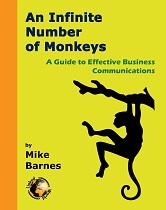 If so, before you spend somewhere between a heck of a lot and an enormous amount on the new products of the information age, why not spend £9.99 on 'An Infinite Number of Monkeys'? It's my essential guide to getting the most from the technology you can buy today and planning for the future. Head to the mini-site for a preview. Website based on a design Copyright © Into the Sky, designed by Alpha Studio. All material on this site is Copyright © Mike Barnes, except where noted.